Assortment 2.5 x 1.5 x 1" 3 x 2.25 x 1" 3.5 x 3.5 x 1" 3.5 x 3.5 x 1.5" 3.5 x 3.5 x 2" 5.5 x 3.5 x 1" 7 x 5 x 1.25" 8 x 2 x 1"
Pink Kraft Jewelry boxes sold in bulk cartons of 100. 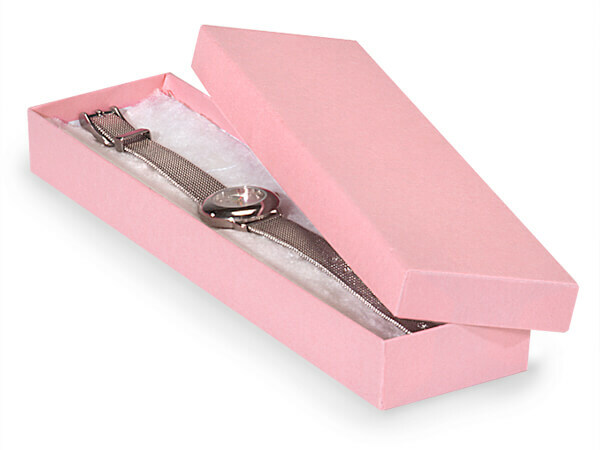 This long 8x2x7/8" size gift boxes are perfect size for chains, watches, bracelets or gifts. Contain 100% recycled boxboard which is the largest component of the box by weight, does not include paper outer wrap. Made in the USA. Our recycled color jewelry boxes come with lids and cotton inserts. These empty jewelry boxes come in an array of sizes and colors perfect for items ranging from earrings to necklaces. The rigid cardboard boxes are sturdy enough for even the heaviest necklace or bracelet. Our jewelry boxes are wholesale priced in bulk cartons of 100. All our two piece jewelry boxes are 100% recycled including the paper covering and proudly made in the USA!